Disclosure: I was compensated for this post. Opinions expressed are 100% my own. 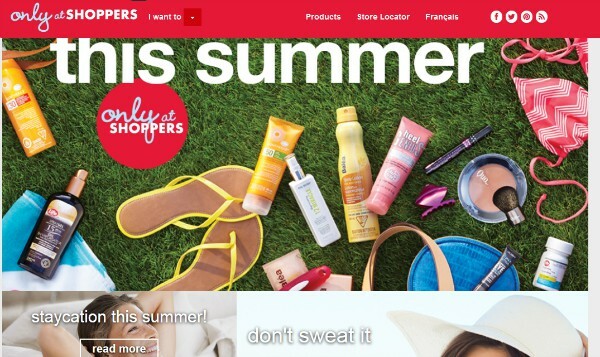 In May, I blogged about Shoppers Drug Mart new digital platform, Only at Shoppers. If you haven’t checked out the site yet, head on over. It’s an excellent source of information for all your summer related topics including health, beauty, organization and more. You’ll find polls, quizzes, tips and tricks, coupons, product recommendations, videos on a variety of topics, depending on the category you are searching in. Do you want to live healthier, feel rejuvenated, look beautiful or be more organized? For me, it’s all of the above! Then if I see a product that I want to try from an article, I can head down to my local Shoppers Drug Mart to pick it up and try it out. My oldest daughter is very much into beauty and fashion and has the site bookmarked on her laptop. We usually go together to Shoppers Drug Mart to pick up the health and beauty items on her list. Summer isn’t over yet though it is flying by. Visit Only at Shoppers for inspiration and information to making this your best summer yet! Connect with Shoppers Drug Mart on Facebook, Twitter and Pinterest. I like the secrets behind CC powder. Summer’s Other Burn. It seems to be a family problem. My favourite article is “first aid 411”. Very informative. “first aid 411″ is my favourite article!! The First Aid 411 has a lot of interesting and informative ideas. “At Home Spa Day” is my fave. Omg…who couldn’t use a shoppers GC!!!!! Summer’s Other Burn – New Year’s Resolution Jan 2014 slowly regaining breadth. Been a long journey – any vitamins/benefits willing to ponder to get over the plateau. Jan 2015 – want to make a different New Year’s Resolution. Who loves you baby personality quiz is my favorite. I liked from Messy to Marvelous. Made our first chore chart this week. So far so good! I like the article on “At Home Spa Day” I like to feel like I have my own spa in my home. I like the beauty sleep 101 article! I liked the “abc’s of spf” … everyone should read them.. especially if you have kids!!! “Too young for osteoporosis?Think again!” It’s a good read for anyone who wants to know more. My favourite article is waxing vs shaving.